I am a recovering perfectionist. In the past, my life was a big ball of anxiety with a side of control-freakishness. Mercifully much of that has changed. Through numerous disciplines – including but not limited to – reading, study, journaling, soul searching, prayer, support and advice from friends, a touch of therapy here and there, and did I mention prayer, I’ve grown and healed and moved toward the life I want to be living. One thing I’ve found to be a key practice in all of this has been confronting fear. The fear of messing up. Fear is a HUGE roadblock to happiness and peace. I used to fight it every single day. It’s amazing to be able to have whole days and possibly even weeks where fear isn’t a nasty beast that rules my days. I could get really comfortable with that very quickly. But when there is no fear at all, the growth seems to stop. So starting a couple years ago when we began podcasting, I began seeking out opportunities to look fear in the face, but on my own terms. Or at least sneak up on it and poke it on the shoulder. Most of the time it is very, very rewarding. Other times it is not so warm and fuzzy. The really interesting thing is that usually when something scary is going on then something amazing seems to happen in tandem. The last few weeks have been an example of that. Through the show and the powers of the internet I have met some amazing people and gotten to do things I never even imagined. This past week, for example, I did my first interview with someone who wasn’t a friend or someone I already knew pretty well. 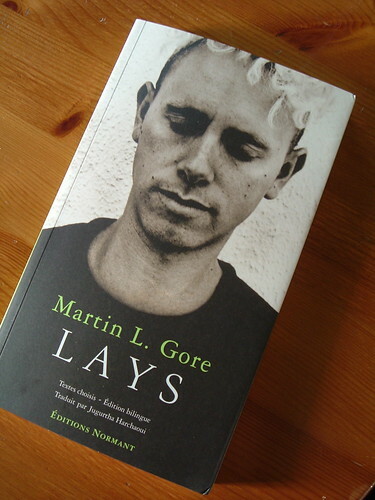 I talked with Jugurtha Harchaoui about his book, Martin L. Gore: Lays. Let me tell you; I was scared silly. I had questions prepared, but you don’t know where a conversation is going to go and I was so afraid I wouldn’t be prepared for every possible direction it could go and I’d end up looking dumb. It’s all about looking dumb. Some dumb you can edit out and some you can’t. I am so happy with how it turned out, but there were moments when I was getting ready to make that Skype call that I thought I would puke. Thank goodness he is so nice and easy to talk to. You can hear our conversation on the May podcast. Another cool thing this past week is that I got to hang out with someone I really admire. 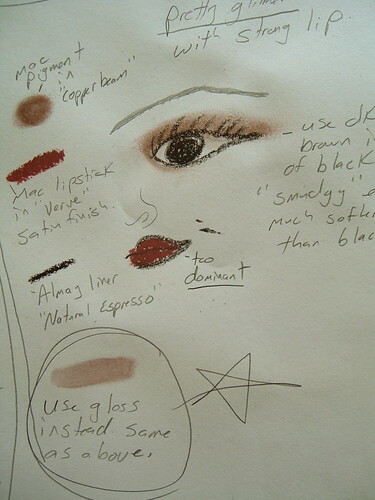 Christa Belle of the band Hungry Lucy offered to help me with some makeup options for an upcoming video shoot for The Sleep. Even though I knew she is a very nice person, I was still nervous about doing something dumb. Or, heaven forbid, that I would be a boring person to hang out with. I was so grateful to have her input and get to pick her brain about her creative projects at the same time. I left with a couple new looks and a head full of inspiration. It’s amazing how creative energy is infectious. You never know what rewards you might get from stepping out and confronting fear. As a result of last week I have the possibility of a writing project to sink my teeth into. At the very least I can work on my writing and let myself play around with something I’ve always dreamed of doing. Which give me yet another opportunity to deal with fear. Because what is more frightening than doing something you’ve always wanted to do? Also I fear that I won’t come up with enough material to do what I envision. And because it is a project that involves someone else, I fear that I’ll let someone down. I could really mess this one up. This sounds like just what is needed right now. I’m ready to go and jump into this one. How about you? What will you be brave about this week? What an inspiring blog Laura, I see pieces of me in there. As I’ve got older and hopefully wiser I have discovered that other people are not perfect either. We don’t have to be perfect… Beauty is in the imperfection. Thanks, Sue. Yes I can be much more forgiving of others’ imperfections. Need to work on forgiving my self more. You are awesome. Really. I love you. we’ve come a long way since high school, haven’t we?? ?